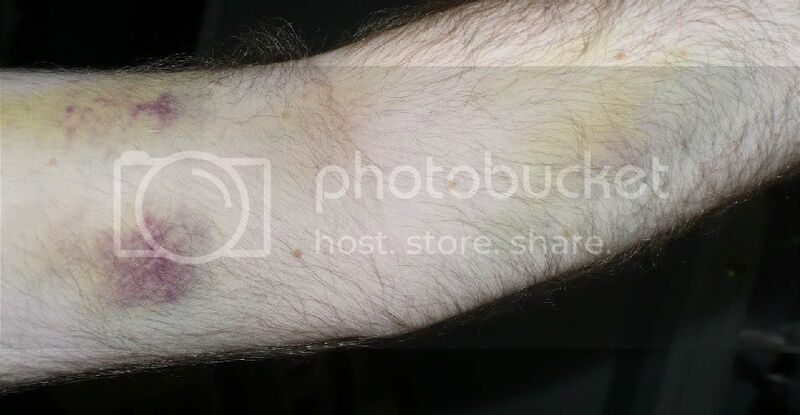 I gave blood last friday and I am bruised. I have given blood lots of times since I turned 17 and I have never been bruised before. But this time is making up for all those other times. The funny thing is the is barely anything where the needle was stuck in. It is all above and below it. Want to see? On a random note. Anyone feel like betaing a few chapters of a Mothman/Dollar Bill fic? Thanks for volunteering. I will send you the info/story soon. WTF!! It looks like an werewolf attacked ya of something!! That was one angry nurse let me tell ya! It felt like that too. For almost a week after I could not stretch my arm all the way out. I will give that a shot. See if it can help to get rid of these nasty things. Obviously he person who handled the set up should NOT be drawing blood. That should NOT have happened. The weird thing about it took three days for all three to appear. The top one appeared Saturday morning, the one under that was Sunday morning, and the one on the lower part was monday morning. It was like elves were beating me up in my sleep or something. Wow, that looks painful! Sorry you got so bruised. The process was like normal but the next few days afterwards sucked. I could not stretch out my left arm. I had to put it against my side and pull it towards my body just so it would lay flat against my body.